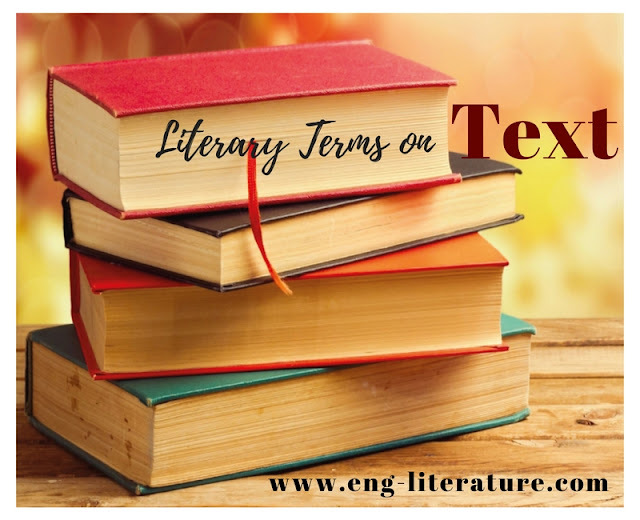 British Literature Literary Terms Short Notes Define and Discuss the Literary Term, "Text"
Define and Discuss the Literary Term, "Text"
The word text comes from the Latin term texere, meaning ‘to weave’. Many critics regard text as a linguistic structure woven out of words or signs. Therefore a text is a human product whose form is achieved by its author’s design and its meanings by the author’s intentional uses of the verbal medium. Therefore, a text contains meaning which is open to interpretation. 1. Descriptive Text: Based on perception in space. It creates a vivid picture of place, characters, events and things which are often to be found in narratives such as novels and short stories. 2. Narrative Text: Based on perception in time. It narrates succession of events in chronological order. For instance, fairy stories, mysteries, science fiction, romances, horror stories, adventure stories, fables, myths and legends, historical narratives, ballads, slice of life, personal experience are this type. 3. Expository Text: It aims at explanation, i.e. the cognitive analysis and subsequent syntheses of complex facts. Example: Essay.